Utilizing advanced LED digital technology and optical calibration systems, the kit quickly and easily tests soil samples for levels of pH, nitrogen, phosphorus, and potash (NPK). 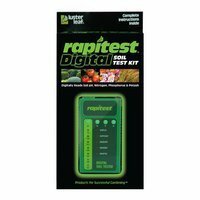 The Digital Soil Test Kit takes the guessing game out of gardening. Just as our health and well-being depend on getting the proper nutrients and vitamins, plants of all types also need proper nutrients for healthy growth. The kit lets you know if there is too much or not enough of a certain nutrient to ensure your plants are getting what they need. If you have any questions about this product by Rapitest, contact us by completing and submitting the form below. If you are looking for a specif part number, please include it with your message.